When touring abroad from our experience about half the campsites we visited in France had the positive and negative terminals wired the wrong way round – ie. reversed polarity. There is a warning light on our electrical control panel that warns us or you can buy a “plug in” polarity checker. To correct the supply you need an adapter which is basically a short electric hook up cable with its positive and negative wires reversed to correct the supply. Generally most electrical equipment will work OK on reversed polarity (they have to be designed and tested to do so) BUT there is a safety risk especially with things like toasters. When a toaster is switched off on reversed polarity the internals remain live! so if someone starts poking out the toast with a knife whilst still plugged in to the supply they risk getting an electric shock. So it is good practice to unplug equipment from the supply when not in use or best to be safe and correct the supply with an adapter. 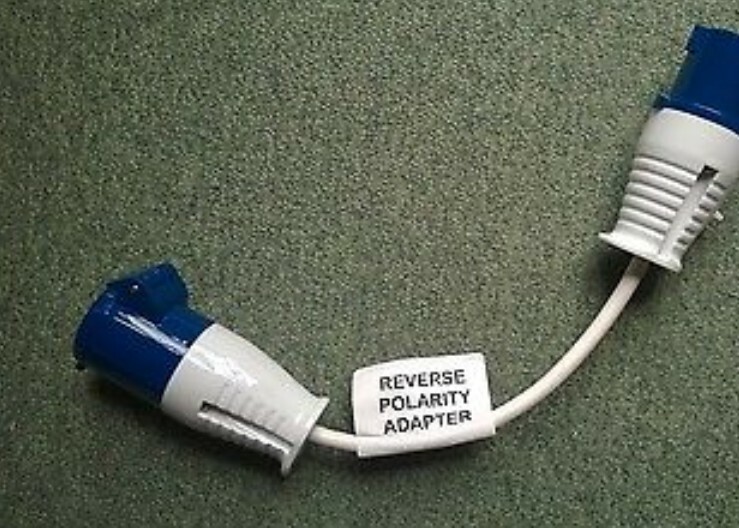 These adapters are available from many places or simply make one yourself plenty of instructions on the internet.